The food we eat is our fuel that takes us through the day. Yet, most of us have to juggle a busy job, family and kids, exercise and errands all while striving to cook healthy meals. 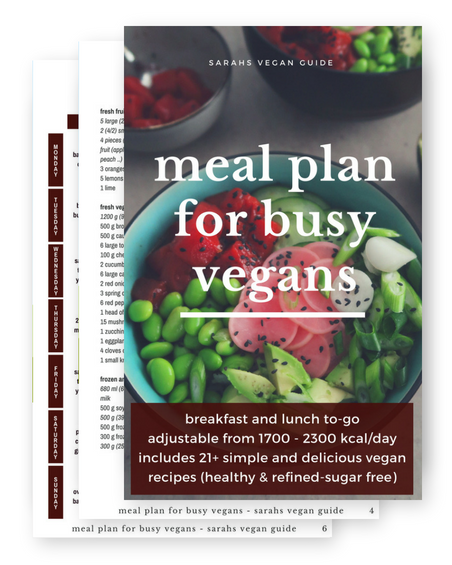 This meal plan gives you a week of simple and healthy vegan meals that can be prepared in only 35 minutes a day. All recipes can be prepared in 25-30 minutes or less. They are healthy and refined-sugar free. You don’t need any fancy kitchen gadgets to prepare the meals, all you need is an oven, a few pots and a smoothie mixer/blender. Not everyone is the same. 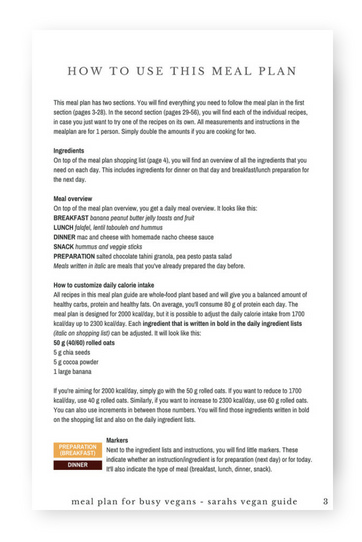 This meal plan takes into account that different people have different needs. You can adjust the daily calorie intake from 1700 to 2300. You are a busy person. Fortunately, that doesn’t mean you cannot enjoy a delicious breakfast and lunch each day. All meals for breakfast and lunch can be prepared the day ahead and to-go. All meals are carefully coordinated and optimized. You only need to spend a maximum of 35 minutes each day in which you’ll cook a nutritious dinner and prepare breakfast and lunch for the next day.